First Line: Lu Hao, a slim, well-dressed man in his twenties stood on the roof of a subcompact car the size of a toaster, peering over a ten-foot-high concrete-block wall and into the parking lot outside an aging tannery. 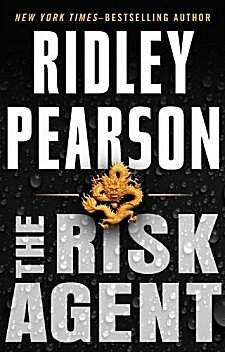 When a Chinese National working for an American company and his security detail are kidnapped on the streets of Shanghai, Rutherford Risk is called in to handle the recovery of the hostages. Private investigation is illegal in China, so handling this matter will be a very delicate affair. The security company brings in two outsiders to find out the identity of the kidnappers. Forensic accountant Grace Chu is hired to follow the money. Her American education and Chinese military service make her a very effective agent. John Knox is a civilian who has a lot of training in combat and knows the language, but his friendship with one of the hostages makes him unpredictable. Following the money proves to be even more complicated than originally anticipated, and people begin to doubt whether Chu and Knox can find out who's behind the kidnapping before the deadline. The further Chu and Knox probe, the more they come to realize that there's a lot more at stake than anyone realizes. Author Ridley Pearson lived in China for a period of time, and it certainly shows in this novel. His portrait of modern China was my favorite part of the book. How the people behave during a national holiday, how the government attempts to find ways to be self-sufficient in agriculture, how huge cities can be built-- seemingly overnight-- and millions of people expected to pack up and move in... all these details and dozens more brought the setting to life for me. The plot has plenty of twists and turns. It's everyone for himself, what's in it for me, don't trust anyone else... all further complicated because the Chinese play by an entirely different set of rules. I have to admit that, the more I read, the more I felt as though the plot had too many twists and too many turns. I was exhausted by book's end, and although The Risk Agent has two strong main characters and a superb setting, in the end it was just an "okay" read for me. If a few twists (and fifty to one hundred pages) had been removed, and the characters emphasized more, I would have loved it. If you're one of the many readers who prefer action to character (and believe me, there's absolutely nothing wrong with that), you probably will love it. Cathy - I'm drawn to characters who are into language, as I have a background in linguistics. And the China setting sounds fascinating. But like you, I'm more into character than action. Still, I might give this a try. It's worth reading for the setting alone, Margot.